Pocket gold is probably best known in the established mining regions of Southern Oregon and Northern California. This is not to say this is the only place where gold pockets occur. 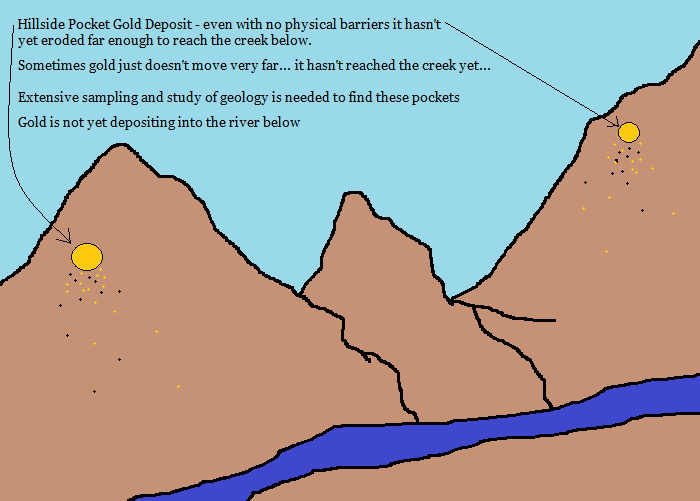 In fact, there are many gold districts throughout the West where these deposits have been found. Similar gold discoveries have been made elsewhere, but these two states have the highest concentrations of these unique gold sources. It is not just the existence of these pockets that make them so noteworthy, but also the immense size and value of some that have been discovered. Some discoveries made during the 1800s were so rich that they would be valued in the millions of dollars today! The areas of special interest are the gold districts of Southern Oregon northern California. In Oregon, most of the gold pockets that have been found are in Jackson, Josephine, and Douglas Counties. Limited gold occurrences also extend into Curry and Coos County also. In California, pocket gold occurs most often within the area that the old-timers referred to as the “Northern Mines.” This is a rich gold bearing area separate from the Mother Lode. The gold occurrences are within Siskiyou, Shasta, and Trinity Counties. What Exactly is Pocket Gold? Pocket gold is different than what is typically found in most areas. It should not be confused with typical stream placer gold, which is a concentration of gold in a river or stream. This gold comes from potentially many different eroded lode sources. Pocket gold is more closely associated with lode gold, but most of these deposits differ because in most cases the gold is extremely localized. Whereas much of the lode gold is mined out of a quartz vein that may travel great distances, pockets are generally gold enrichments found near the surface. Most of them are SMALL. In some cases, ALL of the gold will be localized in a small area of only a few square yards. Once the surface gold is recovered, it is gone. Digging deeper is fruitless in most cases, although there are some established pocket mines in Oregon and California where gold was found several hundred feet in depth. Why is Pocket Gold so Exciting for Prospectors? In many ways, hunting for pocket gold is a true TREASURE HUNT, where the final result has the potential for great wealth. 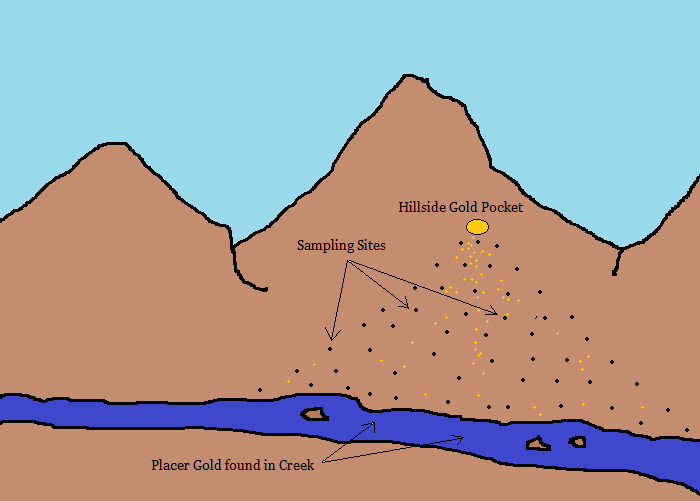 As most gold prospectors know, placer mining using simple tools like gold pans and sluice boxes may result in a gram of gold after a day of hard work, but without the use of mechanized equipment (most notably the suction dredge, use of which has been severely limited/restricted in both Oregon and California) it is very hard for a casual prospector to recover large concentrations of gold nowadays. This is one rare type of gold mining where an individual miner with a simple pick and shovel has all the tools required to mine for pocket gold. And unlike the typical results of placer mining, there is still the potential of making a very large find. Not just a gram or two of gold after a long day of digging. Although there have probably been several thousand gold pockets found in Oregon and California, but there are still undiscovered pockets that have yet to be found. There have been a few discovered in recent years that resulted in pounds of gold! And there are still more out there. The early pocket miners of Southern Oregon and Northern California used a very simple method of locating these pockets. Extensive sampling is required. And they used a process of sampling soil in an inverted “V” to trace sources of gold. Below is an idealized version of the sampling methods used to located pockets. The pocket hunter collects material. Each sample should be the same size and the number of “colors” found in your gold pan is noted. As more samples are taken, the prospector works their way uphill, focusing on the areas with the highest concentration of gold in the sample. Working slowly and carefully uphill and sampling all the way, the prospectors should find that the samples on the outside of the “V” are devoid of gold. The richest samples help direct the prospector on where to go. It would be nice if this process was as clear-cut as it would seem in the textbooks, but the natural terrain and nature of gold can make this process more challenging than it may seem. It must be noted that (despite commonly help beliefs by some) gold does not always travel great distances. It can be easy to miss with basic sampling unless you are just a short distance from the gold source. The gold itself may only be present within perhaps a few feet of the actual source! It doesn’t always trickle down the hillside for hundreds of yards like the first picture would indicate. Gold can also get “hung up,” preventing it from traveling very far at all. 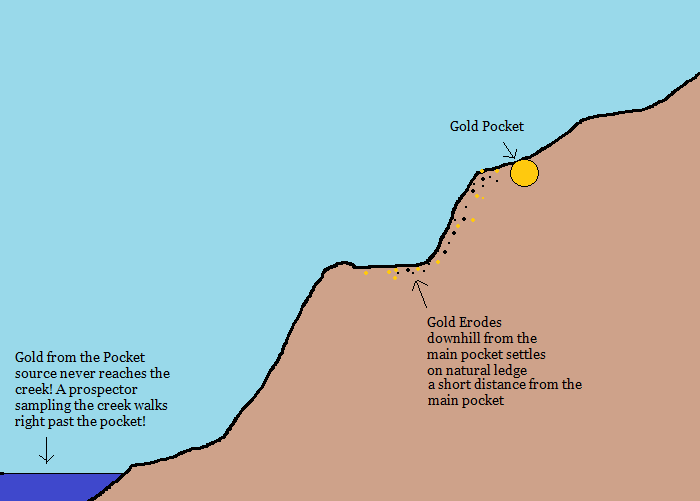 A flat spot in the terrain can easily catch all of the eroding gold from a pocket deposit, preventing it from traveling farther downhill. If you are only sampling down in the bottoms of a gulley, you could easily work right past a rich pocket. Of course, we have new tools to help us in the hunt for pocket gold. The early pocket hunters were limited to just picks, shovels, and gold pans. And while these tools area still important today; there is one more tool that can be especially valuable. Metal detectors can help you find rich pockets that have been missed by the old-timers. A metal detector by itself isn’t likely to help you unless you use it in combination with classic pocket hunting methods. There is a lot of ground out there, so you don’t want to just hunt blindly. If you want to find an undiscovered pocket, you will still need to identify potential areas that show signs of gold deposition. Another method of finding pocket gold with a metal detector is to hunt in pocket country that is known to have dense concentrations of pockets. These locations are often known by experienced miners in these areas, but not documented and can be harder to find if you are new to prospecting. Many pockets were undocumented and no one knew about them except for the finder. Not all metal detectors are ideal for hunting pocket gold. This is one type of gold detecting where a very-low frequency (VLF) detector may be a better choice than the more expensive pulse induction (PI) detectors. This is because pocket gold is often very porous and crystalline textured. And while a good PI detector is usually the best type of gold nugget detector, in the case of crystalline gold a VLF will often outperform the more expensive PI. It is well-known that PI detectors have a tough time “seeing” very porous gold. Not only is pocket gold often crystalline and porous in nature, but the pieces that shed off of the main pocket are often very small bits. This is the type of gold that a sensitive VLF detector is perfect for. Two of my favorite detectors for this type of hunting are the Fisher Gold Bug 2 and the Fisher Gold Bug Pro . I want to tell you right now that pocket gold are very rare, especially today. The early miners found a lot of the surface pockets, and only the empty holes remain. There are still some out there though. I know of several that have been found in Southern Oregon over the past few years that resulted in several troy pounds of gold from each pocket! The picture below is a result of a pocket gold discovery in northern California that was made in 2017. There is about 2 troy ounces of specimen-grade gold here. Each and every piece was found with a metal detector.